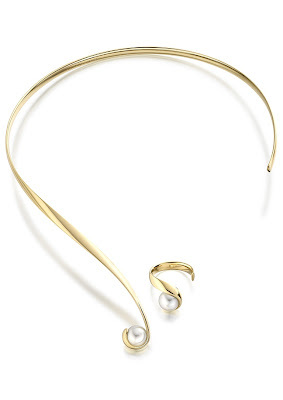 A wave of gold curves sensually to grace a woman’s neck and completes a final graceful swirl gently caressing a large single South Sea pearl. Paul Spurgeon’s style as a Fine Jeweller and Master Goldsmith is distinctive and renowned for its simplicity and elegance. The modest window at 1 East Street, St Ives, Huntingdon, seeks not confuse the eye with an excess of distracting sparkle and sell-now products. It is an invitation to those looking for exquisite bespoke jewellery, designed for the individual client. Paul’s workshop is visible and accessible next to the studio where you might visualise your dreams in platinum and sparkling diamonds. Paul Spurgeon’s apprenticeship to David Pearce led onwards to commissions for Elton John & Suzi Quattro and to his own independent business in 1984. Inspired by the work of other master jewellers, Paul is a two-time UK Jewellery Award winner, with De Beers promotional campaigns under his belt. Coming from a background of over the top and richly detailed influences, he has evolved is own unique pared down aesthetic of simple, beautiful lines. Paul commented on being featured in the 2012/2013 Goldsmith’s review, “What’s an Essex lad doing in here!” His wonder and appreciation, that becoming a master in your art can be life changing, has led to Paul devoting time and effort to encourage and develop new craftsmen in disadvantaged regions in South Africa and Afghanistan. In 2009 he formed a partnership with Soweto born jeweller Nqobile Nkosi to create Cornerstone. The result is a coming together of creative ‘hearts and minds’ from the African communities fused with a European influence, expressed in silver and stone. With his own craftsmanship and through collaborations, Paul Spurgeon in St Ives has something to offer the discerning client, whatever your pocket,. “But why come to St Ives?” I asked Nicola, who has worked with Paul for nearly a decade. “He loves the river and the town!” Was the simple answer. And who can blame him. St Ives is a jewel in the East of England. Visit Paul Sturgeon' site or gallery in 1 East Street, St Ives, Huntingdon. Anyone would be pleased to see one of your writeup in appreciation of one's business Chris. Thanks Brian! There are probably many interesting stories hidden in your memory, and with music!